Looking for a unique way to unwind? Shed your citified persona and spend a few days at a Texas guest ranch. With acres of natural beauty and plenty of creature comforts, these popular getaways offer experienced ranch hands who can have you riding the range in no time. Everyone has a preferred way to relax and unwind, whether it’s exercising, spending time with family and friends or setting aside time to not do much of anything in particular. Happily, there’s a way to roll all three of these things into one unique relaxation destination. 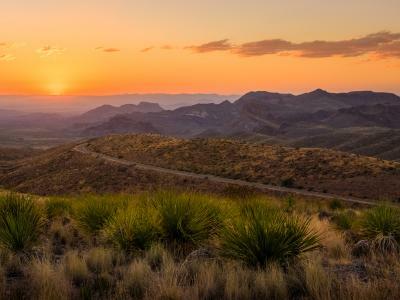 Simply pack up your favorite faded blue jeans and mosey over to one of Texas’ many wonderful and welcoming guest ranches. For a rustic Western experience softened by modern amenities, our family recently visited Wildcatter Ranch, just 90 minutes northeast of Fort Worth. The ranch stretches across 1,500 acres of rolling green hills that overlook the Brazos River. There is a long list of activities for adults and families, all designed to provide as much or as little participation as you like. On our first day at the ranch, we got our bearings by strolling along a few of the tree-shaded hiking trails, taking a dip in the infinity-edge pool and meeting some of our fellow ranchers for dinner. By the time morning rolled around, we were ready to cowboy up. Daily trail rides allow guests to put their seats in a saddle and explore the farther reaches of ranchland. Knowledgeable cowboys help each rider find a horse that matches his or her experience. Our kids—ages 10 and 13—were thrilled with ponies of their own and couldn’t wait to get in the saddle. As we clip-clopped along the trail, the sun sent beams of light through the swaying oak trees. We passed a few white-tailed deer that glanced at us, completely nonplussed, and then went back to nibbling the grass. We saw several butterflies and birds, including a hawk that soared in quite low before landing on a tree stump to watch us pass. Afternoons at Wildcatter can be spent any number of ways, from sport clay shooting and archery to massages at Sage, the on-site spa. As the sun began to set, we all hopped aboard a wagon and rode out into the field to feed the cattle. Our son held out some pellets for Big Boy, one of the longhorns on the property, and let him nibble from the palm of his hand. 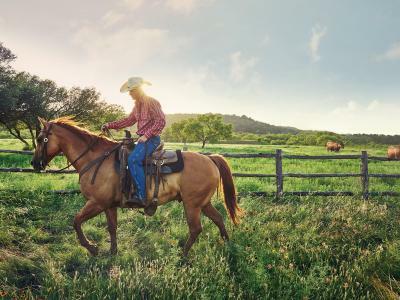 Known as the Cowboy Capital of the World®, the town of Bandera and the surrounding hills encompass about a dozen ranches that give guests an authentic taste of the cowpoke lifestyle. The Sugar and Spice Ranch is located a short drive north of Bandera on 1,000 acres of gorgeous Hill Country terrain. From the minute we arrived, the ranch felt like home. This is a working ranch, so it was a great place to experience real Western-style fun. We were each paired with a horse that matched our abilities, and before we went riding, they showed us how to care for the horses. The kids loved learning to brush the horse down, then put on the blanket, saddle and bridle. Afterwards, they felt more than ready to head to the arena for riding lessons. Once we all felt “tall in the saddle,” we participated in a trail ride. We also ate meals with other guests who quickly became friends, spent time cooling off in the swimming pool and even attended a local rodeo. While chatting with “Ms. Leigh” (Leigh McCourt, the owner), I got details about Sugar and Spice’s Women-Only Weekend events. With one price that includes a bed in the bunkhouse, plus all meals, accommodations and activities, it sounded like an ideal choice for the next girls’ getaway with my best cowgirl buddies. 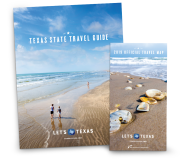 About an hour northwest of Houston is Washington County, an idyllic part of the state that’s awash in huge live oak trees, fields of wildflowers and charm-drenched small towns. My husband and I escaped the city a few months ago and found peace and quiet in spades at the BlissWood Bed and Breakfast Ranch, located on a 650-acre working ranch in Cat Spring, just north of Brenham. The guesthouse had country antiques and comfy rocking chairs—a must-have for any authentic guest ranch getaway. We went bass fishing (catch-and-release) on the stocked lake and rode horses across a picture-perfect meadow. Among the other animals on the ranch—many of which we saw on our horseback rides or evening walks—were exotic species like alpacas, camels, antelopes, peacocks and bison. One afternoon, I left my napping husband to drive to the nearby Chappell Hill Lavender Farm, where I cut fresh lavender straight from the fields ($5 a bunch) and bought gifts for friends that included body lotion, bath salts and linen spray, all infused with the luscious aroma of fresh lavender. In the America of the late 1890s, modernity was on the move in the form of the telegraph, “moving pictures” and indoor plumbing. In a desire to return to a simpler time, wealthy Easterners paid good money to become “cowboys” at working ranches, and the ranches were happy for the additional income. Texas “dude” ranches especially flourished after World War I, when the price of beef dramatically decreased.